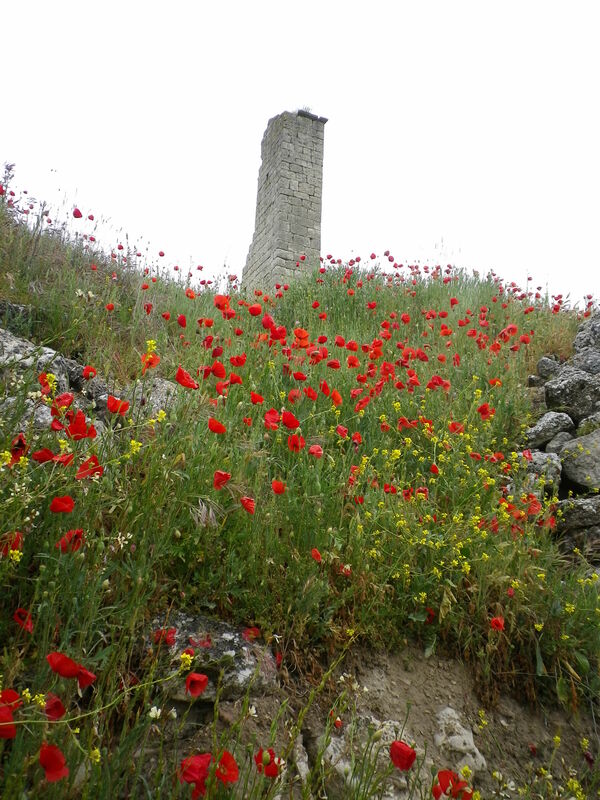 The Meseta was overcast, cold, gray and windy. But it was very pretty. The fields were all the shades of green, with thousands of flowers in full bloom. The Camino was quiet because no one was walking nearby and the path was too narrow for bicycle riders. I stopped at San Bol for my morning cafe because the albergue there was said to have a little pond where pilgrims who stayed overnight could soak their weary feet. The food was good, the hospitaleros very friendly, but it was too cold for taking off socks and soaking in icy cold water. Brrrrr! 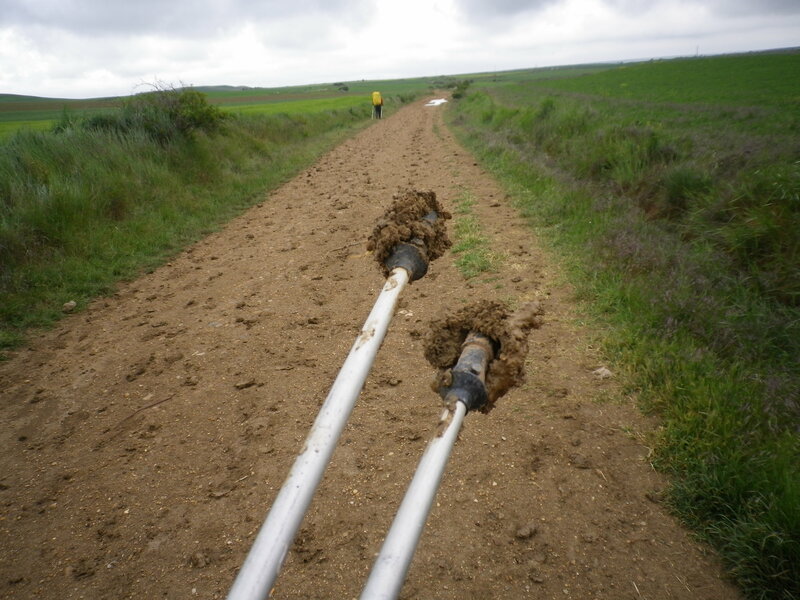 The Camino achieved a new level of muddiness that day, also. A squishy, slurpy, yet “let-me-velcro-onto-your-boots-poles-and-pants” level of stickiness that would make it great to build houses out of. This stuff simply didn’t come off. 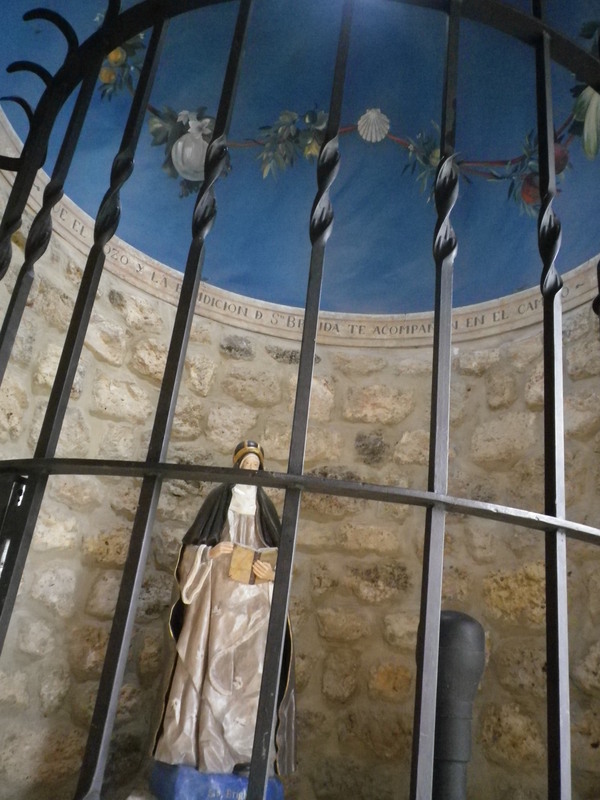 There was a tiny “ermita” for Saint Brigida just outside Hontanas. It wasn’t mentioned in my guidebook. But it is dainty and clearly built for quiet reflection rather than for groups to enter and photograph. 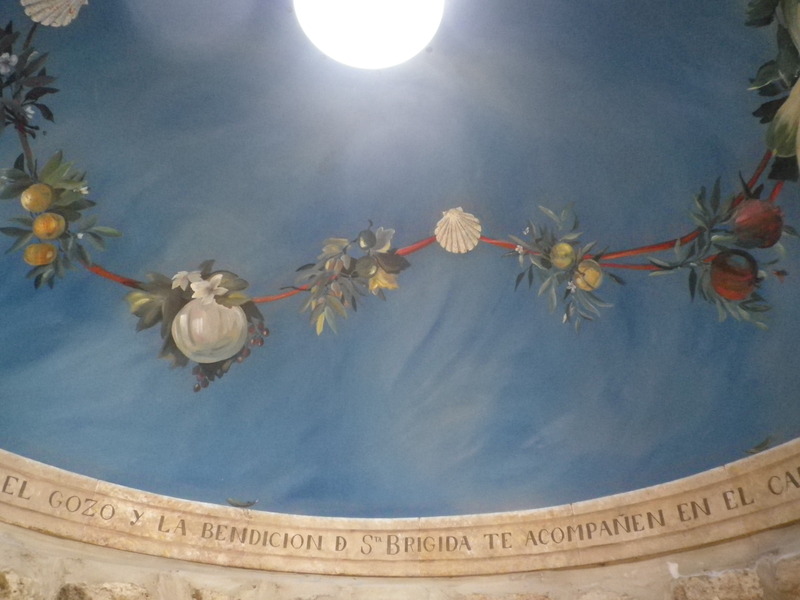 The mural inside was tenderly painted for the pilgrim and local to view. Finally coming to the end of the day’s journey, I had to pass through the abandoned ruins of San Anton. Amazingly majestic, it reminded me of the scene in “Lord of the Rings” in which the fellowship floats past the gigantic ruins of the ancient statues guarding the entry to the next region – you know, where the helicopter shot flies over the tops of the ruins. If these ruins in San Anton were the remnants, I can only imagine how magnificent this Convento de San Anton must have been in its fourteenth century heyday. 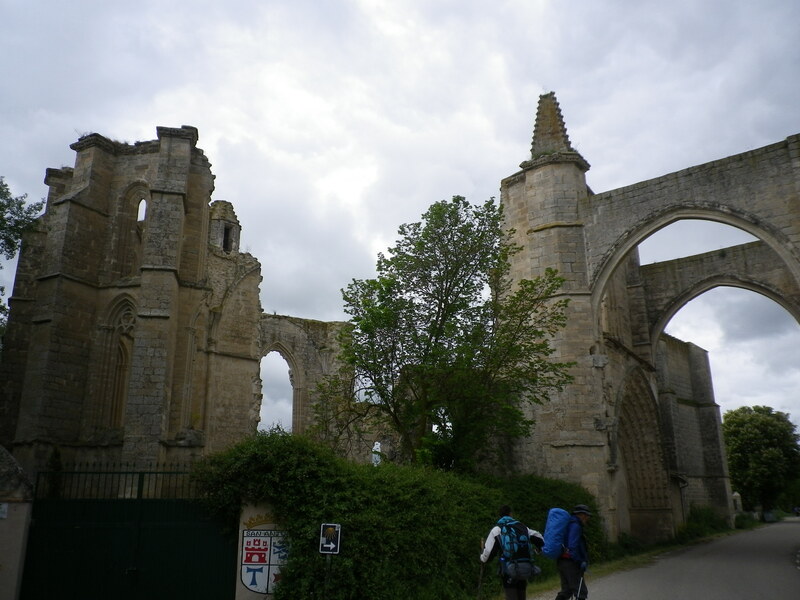 Arriving at Castrojeriz, I missed the classic photo of the ruined castle overlooking the town below because of – yep – rain. I made my way into town, discouraged as I walked from one albergue to another, finding them full if they were municipals, too expensive (30 euro for a single?!!!) if they were private. I finally found a municipal which would not open until 1500 but would have room so it would be my home for the night. It was raining and there were more and more pilgrims sloshing their way into the tiny waiting room but I found a spot on the floor and sat. My glasses, which had broken in Burgos, were broken again! I would have to wear my geeky extra pair (thank you, DH, for advising me to take them) until I came to a real city again. The wait in the room dragged on and I considered sharing a taxi with another perergrina to the next town in order to get a bed for the night. But, when she investigated the cost of such a trip, the locals advised her to be patient, the walk to the next town was one of the loveliest on the Camino and we wouldn’t want to miss it. So, we waited. The hospitaleros were determined to cheer up this group of tired, mentally exhausted pilgrims. They cajoled, joked, hugged, insisting upon relieving those pilgrims who looked scared and lonely into relaxing and giving a hint of a smile. They chose who would sleep where, based on their intuition, not on who was at the front of the line! It worked out well. The obnoxious showman got a bed in the catacombs, the quiet Canadian lady got a bed in a roomy upstairs corner, older people got bottom bunks, college kids got the upper bunks, couples were close together, everyone had space. I walked towards the supermarket to get dinner. I wanted hot soup but there was no kitchen in the albergue, not even a microwave, so I stopped at a local restaurant which advertised its local soup and asked about getting a few bowls to take back to the albergue with me. No problem, I was told, except they wouldn’t start serving until dinner in about 2 hours. I said I would be back but never did return. I bought a cold dinner of wine, cheese, ham, bread and chips at the supermarket. 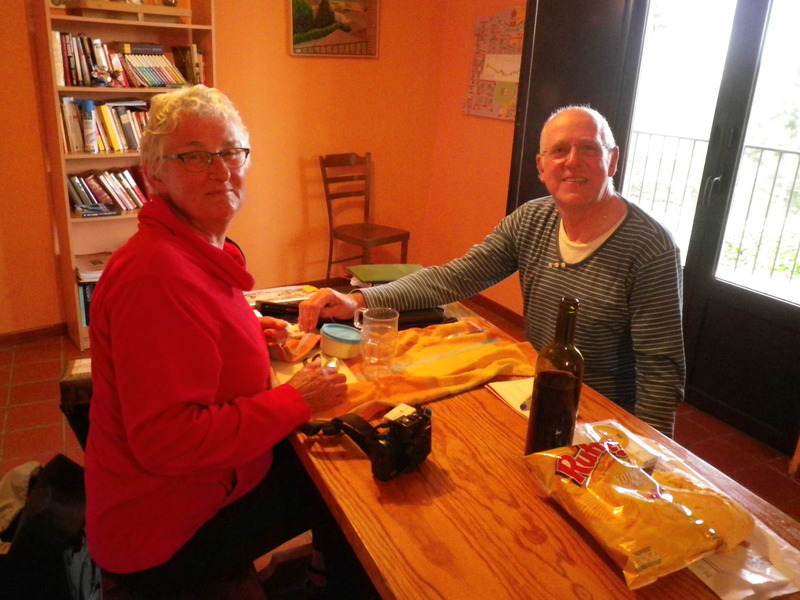 At the albergue, I had no cup, no plate, no knife, fork or spoon, so I drank from the bottle, ate with my fingers, borrowed a knife, and learned, from a wonderful Dutch couple who were bicycling their way to Santiago, the difference between Holland and the Nederlands. Oh. Did I mention the fistfight that (almost) broke out between two pilgrims? No? I guess I’ll have to leave it for another post. 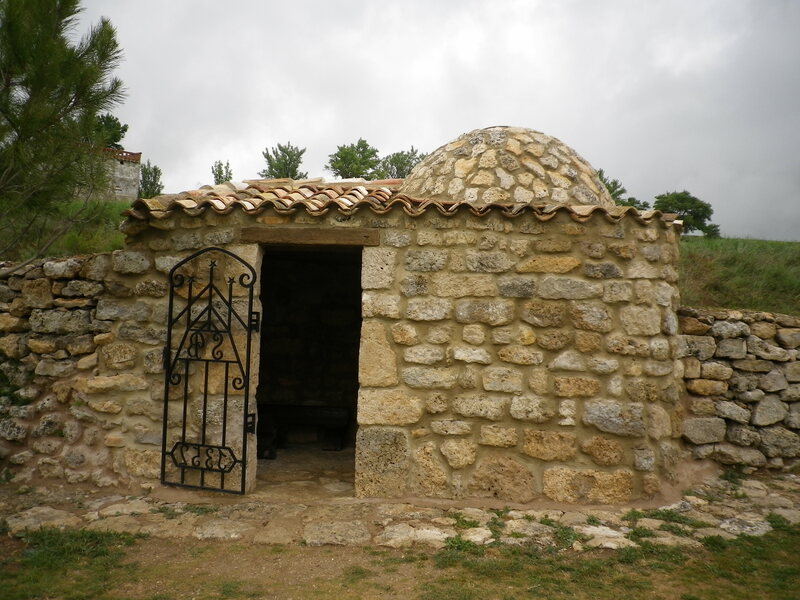 This entry was posted in camino de santiago de campostella, Saints, Spain, Travel and tagged backpack, Camino de Santiago de Campostella, hiking, Lord of the Rings, meseta, mud, Saints, Spain, Travel. Bookmark the permalink.